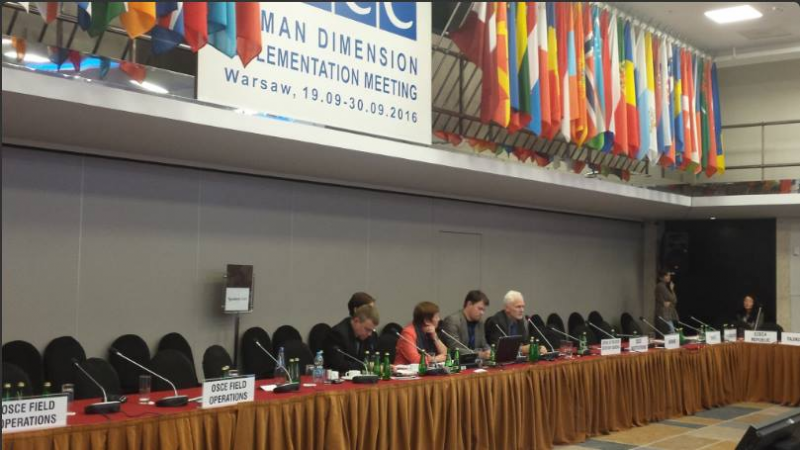 Representatives of the Belarusian human rights organizations at the OSCE Human Dimension Implementation Meeting. Warsaw, September 22, 2016. Assessment of the situation of human rights in connection with the election campaign was shared by Ales Bialiatski, head of the Human Rights Center "Viasna", Uladzimir Labkovich, coordinator of the campaign "Human Rights Defenders for Free Elections", Zhanna Litvina, ex-chairperson of the Belarusian Association of Journalists, Volha Smalianka, head of the Legal Transformation Center Lawtrend, and lawyer Yury Chavusau of the Belarusian Pro-Democratic NGOs’ Assembly. "We discussed the situation that prevailed on the eve of elections and immediately after them. And our assessments agreed in many aspects. We came to the conclusion that the situation is difficult. After the lifting of sanctions in February this year the human rights situation has in fact been frozen and there were no improvements, and we even note certain deterioration because we have new political prisoners, and the authorities in the same way as before have persecuted opposition activists by imposing administrative detentions and fines. The campaign itself took place in a hostile atmosphere, the candidates did not enjoy equal access to the media, and in fact the elections were rigged,” Ales Bialiatski said following the event. "The elections were neither transparent nor democratic. Moreover, there is no indication that the authorities have changed their attitude and methods of pressure on activists and control over the civil society in Belarus. This pressure continues and it is still too early to speak about liberalization or any democratic steps, even small ones." The participants also touched upon the issues of the death penalty, freedom of assembly and freedom of association, and came to the conclusion that in general there are no changes in Belarus. "I think we were able to convey to the international community our concerns and anxieties, to bring first-hand information, and it was quite important. I think the government has been unable to downplay the problems, to make it better than it is in reality, because there is civilian control of the Belarusian human rights defenders and non-governmental organizations,” Viasna leader said.